Thus, begins and ends this exotic retelling of a tale from the Arabian Nights. It's a story within a story. A group of refugees are stranded in a small dinghy with no oars, motor or maps and the threat of the rising tide. They're looking for a safe harbor. Rami, one of the refugees, grips a slim case to his chest. When he opens it, the others are curious to see a violin "sleeping in a bed of dark velvet . . . too fragile, too intricate, too beautiful. Suspended in silence from some other world." The others are surprised when Rami tells them that this violin is the only thing he took with him when he had to leave quickly. He tells them that it remembers many stories and can play many songs. Then Rami begins to slide the bow across the strings and, through the musical notes, he begins to tell a story that "no religion or nation can claim the story for its own. It belongs to us all. It is the song of freedom. It is the story like the wind." As Rami begins his story, the musical notes soar towards the sky like the swirling wind. 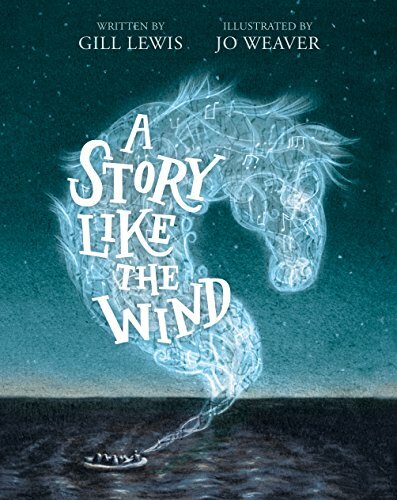 This tale is about Suke, a young boy, who finds a dead horse and its newborn white foal, barely alive. Suke takes it home and nurses it back to life. It's his love that keeps the foal alive. As Suke becomes a man, the foal grows into a white stallion that follows him everywhere. They become best friends. He decides to ride the stallion in a great race across the plains. As they enter the market place, "Rami lets his bow trip back and forth, the notes sliding and jostling with each other, faster and faster . . . The notes haggle and chatter while Rami's fingers dance along the strings." The music brings warmth to the boat peoples' shivering bodies as they huddle together and begin to tell stories of their homeland. Then Rami continues the story of Suke. The Dark Lord threatens him with expulsion from the land if he wins this race. But the white stallion wins and the Dark Lord tries to tame him. "He is like the wind," said Suke. "However hard you try, you cannot tame the wind." As the music pervades the air, the refugees continue their nostalgic journey to their own lives before the shipwreck. Then "Rami lifts the bow, and the notes spill out like tears into the wind, picking up the story." This beautifully illustrated fable is about a violin, love, kindness and the struggle for freedom. It's a story of loss and the power of music to foster friendships, hope and recovery. It provokes feelings of sadness, happiness and nostalgia in the reader. The text's charcoal green and white drawings bring life to the characters. Some of the words and letters are shaped in a pattern of semi-circles as if they are actually spinning in the frigid waters. The author gives Rami's violin and musical notes human traits. Gill Lewis, veterinarian, writes books about animals and the wild. Jo Weaver, illustrator, feels close to nature and also writes about the wild. A perfect combination to captivate their readers. Although written as a children's book, people of all ages will be charmed by this timeless tale.